The deeper the rim, the more aerodynamic they are and the faster you go - when riding at any speed. The faster you go the more speed you gain because aerodynamics play a larger part of your speed. Where I live in San Luis Obispo CA, there is almost always wind and if you are riding into a head wind you need to figure that wind speed into your speed calculation. The downside of carbon wheels is they weigh more than a smaller profile (carbon wheel) and they are more affected by side winds. But the side wind issue has been somewhat mitigated by the bullet type profile of these. You also need carbon specific brake pads and they typically don't last as long as regular brake pads. So that you live with. Weight 1360 grams (without skewers) weights can vary by about 50 grams a set due to rim, spoke, and hub weight tollerances. We provide valve extenders that work with tubes with removeable cores. If you are not familiar with them, the trick is to remove the valve stem core from the tube (it will have two flat sides - you can remove it with needle nose pliers or a very very small wrench). Thread the valve extender onto the base of the valve - extending it - then thread in the core into the end of the extender. I recommend using a piece of electrical tape around the core where it adjoins the rim. If you don't the core will click against the rim - driving you crazy. I purchased a set of C50 tubulars to race on. I was tired of spending money on the high-dollar carbon wheels. These wheels look great. I ordered mine with black hubs and spokes. I personally like the fact that they don't have any decals or markings. I never liked paying an outrageous price for wheels and then getting to be a rolling bill board for their brand. 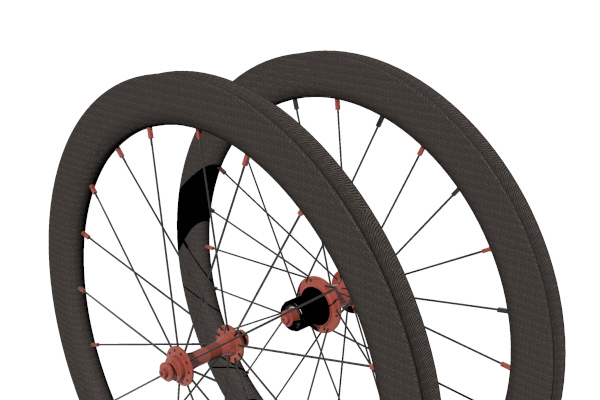 I have ridden many carbon wheels and the brakes surface on these wheels are excellent. I use Swiss Stop yellow pads and I was amazed the first time I hit the brakes. I was torn between the 50's and the 38's but my first race on the 50's put my mind at ease. These wheels are fast and the aerodynamics offset the weight differential between the two. Out of the box, I checked these wheels on a truing stand and they were spot on true and there were no hops. The only minor con was that the stem holes were tight. For anyone looking for really good, no nonsense wheels, this is the Real Deal. I'm extremely pleased.